I took the stained glass class at the Des Moines Art Center about 15 years ago, before we had kids, before we had an historic home. I mostly paid attention to the stained glass technique called “foiling” which is better suited for small projects, as opposed to leaded glass, which is better for larger windows like I want to do in the Hatton House. So when my parents asked what I wanted for my birthday/Hanukkah, the answer was easy: Stained Glass Class! Turns out, it’s the same teacher still teaching at the Art Center, Jerry Goodrich, who was very supportive in my crazy idea to do a 12×27″ transom window in the scope of a six week class, especially after over a decade break in glass work. I free-hand drew an adaptation of the Keith family crest, altering it from the typical vertical to horizontal. The glass cutting and grinding came back fast enough, but this was my first project in lead, the that was more tricky than I bargained for. After much cursing and one last minute broken piece, it came together nicely. 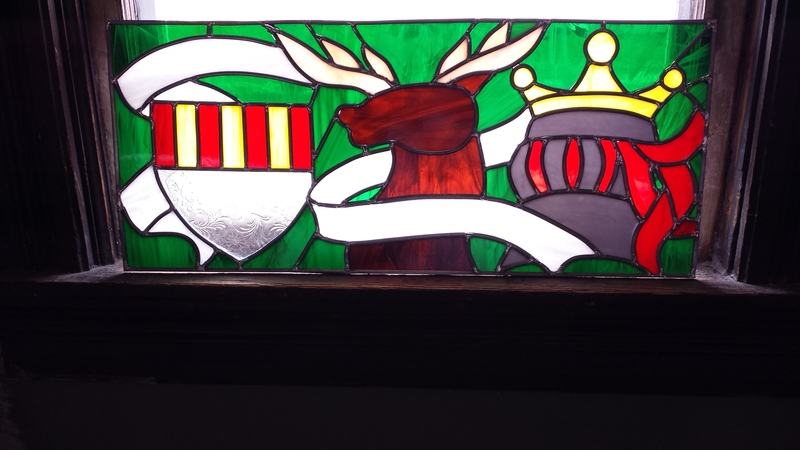 I still need to cement it, and I haven’t decided if I’m going to add the family motto “Veritas Vincit” in the white banner, but here’s the first of six transoms I want to do in the house! We have a Goodsmiths store now for the art created here! Proceeds go to supporting the restoration of the house, so you get handmade art AND that feel good thing in helping restore the house! As we work on restoring the house, we’ve started to think of this place as a retreat for artists and writers to some day come and stay and refresh their creative spirits. while we prepare the house for overnight guests, I will sometimes invite over my artist friends to create with me as I am painting or making pottery. The eat-in kitchen has become the studio, and I love having friends or my kids around me as I create new work. The Juice Company in the Shops at Roosevelt currently has a show of our work hanging for you to see some of the things that we’ve been working on this Summer. 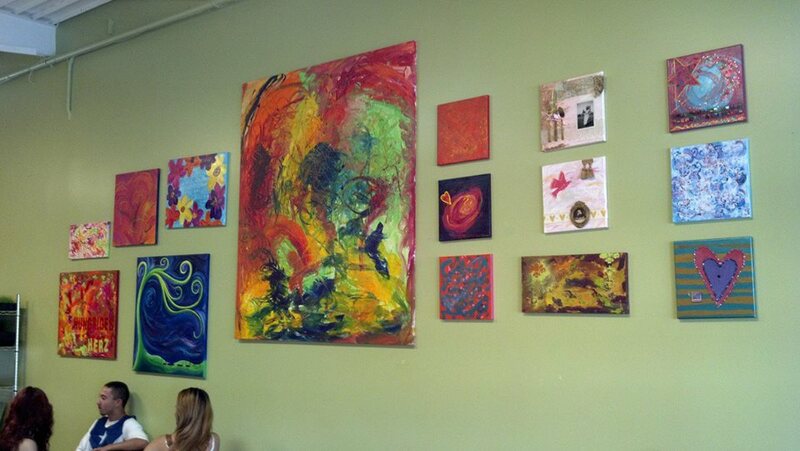 On the north wall is mixed media artist Amy Carrell, and on the south wall are paintings by me, Tanya Keith. My pieces are acrylic and mixed media paintings, featuring works with Hebrew and German language, a few that my children collaborated with me. I hope you’ll stop by, grab a smoothie and check out some of our work, and maybe even do a little early holiday shopping! Local art that supports local restoration is sure to be a hit! I loved the prayer “Hashkiveinu” since I learned it as a lullaby ten years ago when my daughter was born. I love it as a prayer of meditation of calming in a chaotic world. This painting seemed to fit. 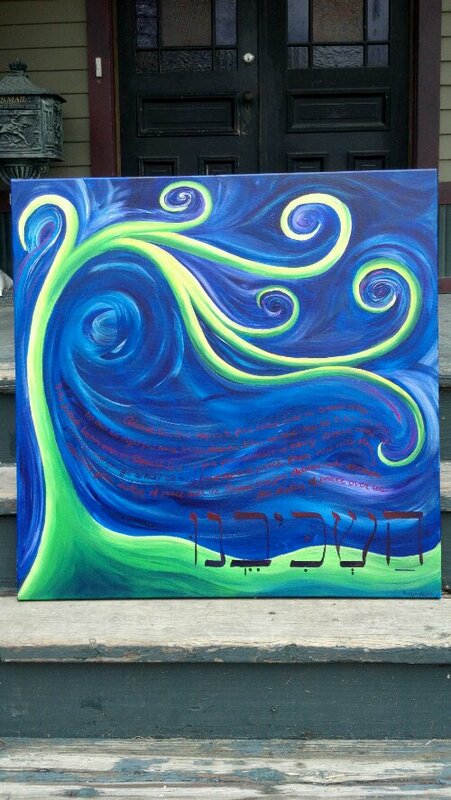 I’m enjoying painting in Hebrew, but I put the prayer text in English, for those of us who would struggle with that much Hebrew. We’ve been working on Hebrew study for my Bat Mitzvah, which I promised to accomplish before Aviva’s on August 15, 2015 (tick tock, tick tock, tick tock) and I’ve been working on incorporating some Hebrew into my work. I love the connection to my ancestors that I feel when I’m studying this ancient language. 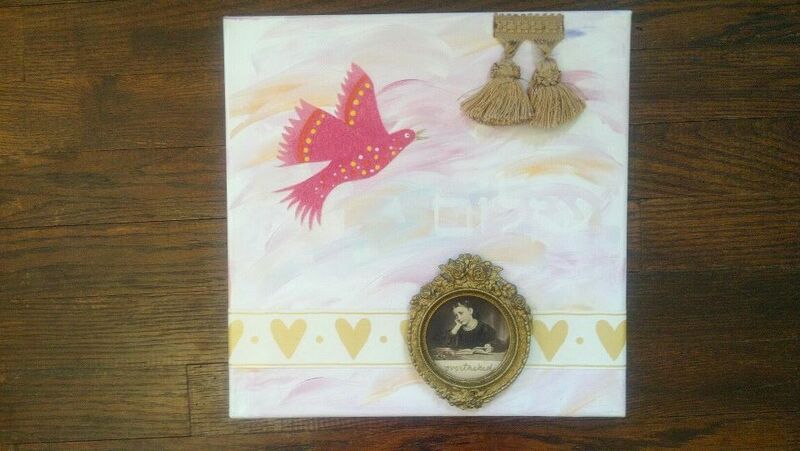 This canvas was about Shalom (which is what the white letters spell), or peace, and started with the bird that I found in my scraps from when I used to design kids rooms. I was thinking about how hard I used to work at my company, and how sad it made me to be away from my kids. I went through my antique photo file looking for a photo that would fit the painting. I found this lovely bit of a woman, slaving away at the books, and it captured my mood perfectly. 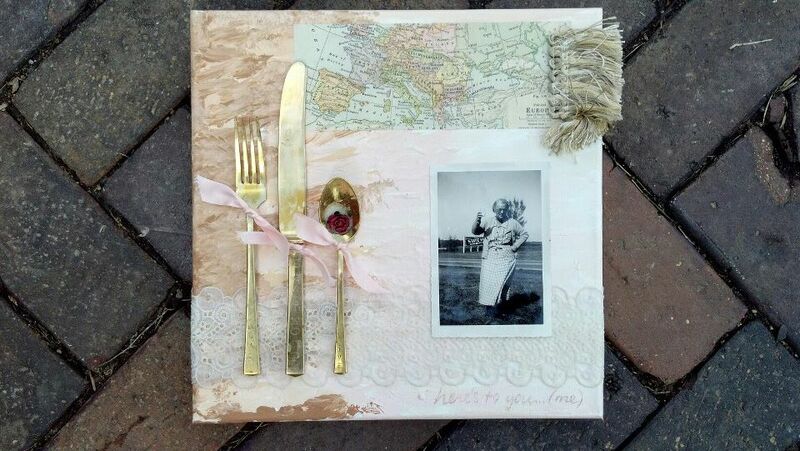 Then I flipped it over, and the photo was titled “Overtasked,” I word I just love! It was Beshert…”meant to be” which is my next word to incorporate! 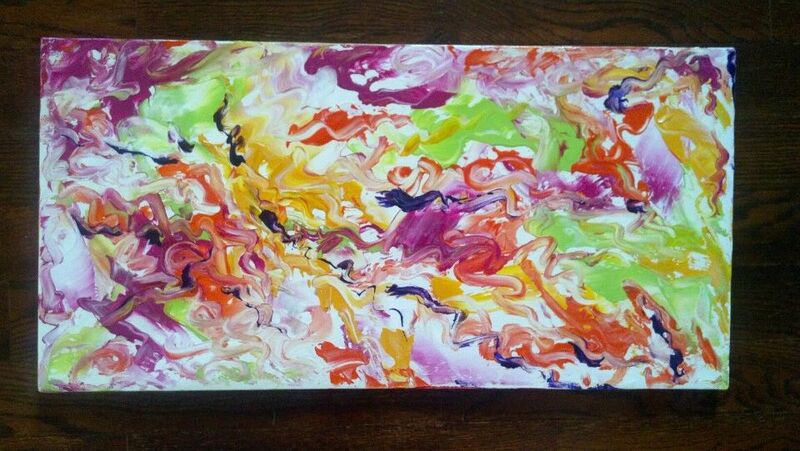 I spent the afternoon doing abstract art with my daughter, Aviva. We were having artistic disagreements, so on this round, we each did our own canvases. This is what it’s like working with Aviva: a giant ball of great creative energy that can’t be directed. Even when she makes me crazy smearing paint all muddy (on the previous canvas) I love her, and even love how she pushes my creative boundaries (to the brink).